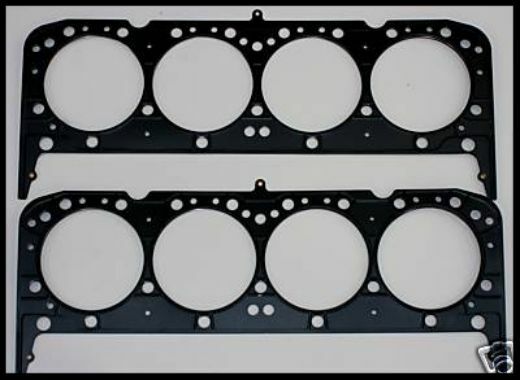 These stainless multi layer head gaskets have an opening size of 4.165 average size to accomadate the combustion chambers of most all aftermarket heads. We have used these gaskets on many of our engine builds without a problem. This auction is for 2 head gaskets. A must for those changing over to aluminum heads. Fits all standard Gen 1 Chevy engines up to 4.155 bore without steam holes. 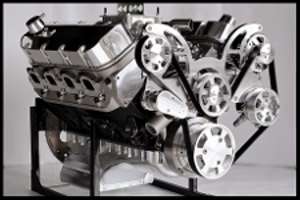 This size will cover engines such as the Chevy 350/355/383 and 400/406 blocks that are using heads that have no steam holes. Our technical knowledge is limited on this product. Our sales staff are usually unable to answer many of the questions asked. Many of the questions are, "how do you install this item", "what model cars will this work in". Most of the people on our sales staff simply don't know these answers, and even if we did, the time involved answering so many of these questions is what led us to writing this notice. We update the info in our listings on a regular basis, and if it's not in the ad, then there's a good chance we don't know the info. There is a solution to this problem for those with numerous questions about the product. We recommend searching the car forums for application questions, or technical info. You will find the answers you need on the forums for certain. You have all heard the saying that a picture is worth a thousand words. Well, it is, and with that being said, a video is worth a million words. If you go to YouTube and type in the correct key words or phrases, you may find dozens of highly informative videos showing much of the info you need to know on this product.